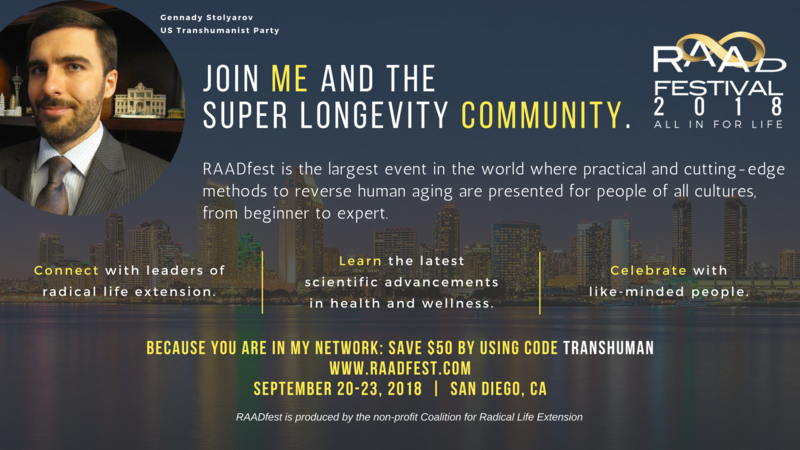 The U.S. Transhumanist Party will again be represented at RAAD Fest in San Diego. Chairman Gennady Stolyarov II will be attending RAAD Fest 2018 and will be moderating a panel of speakers as well as presenting regarding the accomplishments of the Transhumanist Party over the most recent year as of September 20-23, 2018. There will be an opportunity for a sizable Transhumanist Party presence, and we are contemplating a meeting of U.S. Transhumanist Party members that would be open to the public and media. It is possible to register for RAAD Fest 2018 at the website raadfest.com. By entering the code TRANSHUMAN, attendees will be able to save $50 off of the cost of registration. More details regarding Mr. Stolyarov’s presence and activities at RAAD Fest 2018 will be announced as they become available. We look forward to seeing you there! Find more information regarding the FreedomFest panel here. Become a member of the U.S. Transhumanist Party for free by filling out our concise application form. 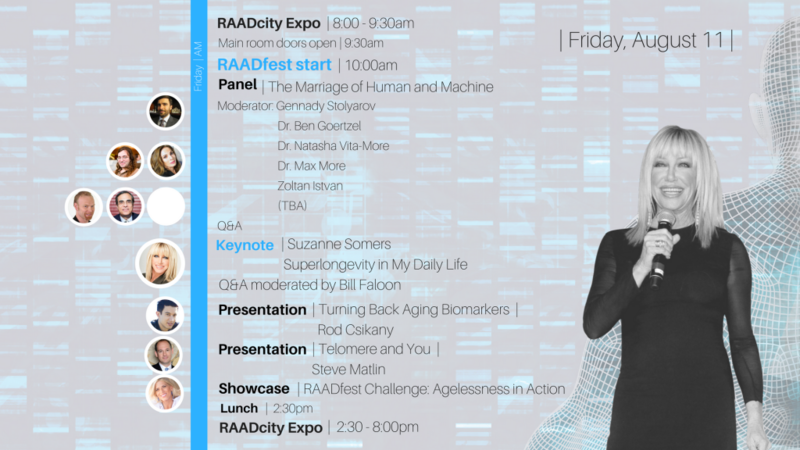 The U.S. Transhumanist Party is pleased to announce that, as part of its presence at RAAD Fest 2017 in San Diego, Chairman Gennady Stolyarov II will be moderating a panel consisting of transhumanist philosophers, researchers, and activists – including Zoltan Istvan, Dr. Ben Goertzel, Dr. Max More, and Dr. Natasha Vita-More. You can see the full RAAD Fest schedule here. The panel moderated by Mr. Stolyarov will occur at 10 a.m. on Friday, August 11, 2017. Machine augmentation of human bodies and minds will be one topic of discussion; transhumanist politics will be another. As previously announced, Mr. Stolyarov will inaugurate the panel with a brief presentation entitled “The U.S. Transhumanist Party: Pursuing a Peaceful Political Revolution for Longevity”. Listen to and download the audio recording of this panel discussion at http://rationalargumentator.com/USTP_Life_Extension_Panel.mp3 (right-click to download). 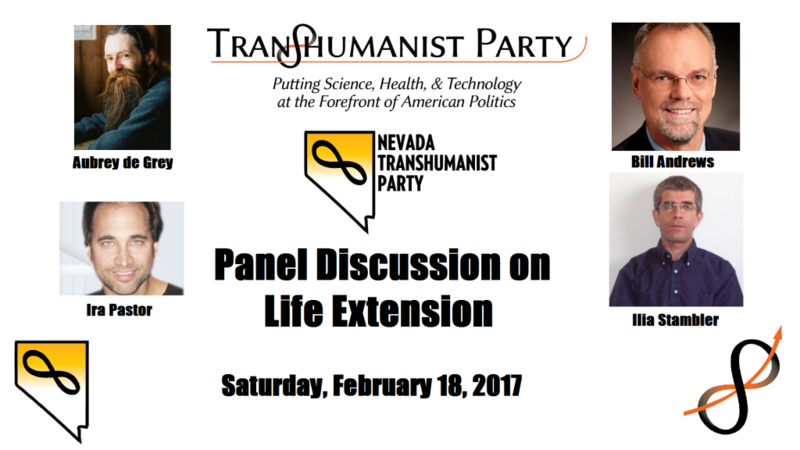 For its second expert panel, the U.S. Transhumanist Party invited Bill Andrews, Aubrey de Grey, Ira Pastor, and Ilia Stambler to discuss life extension and the quest to reverse biological aging through science and technology. This two-hour panel discussion, moderated by Chairman Gennady Stolyarov II, took place on Saturday, February 18, 2017, at 10 a.m. U.S. Pacific Time. In this interactive venue, many opportunities for fresh discourse arose on the possibility of achieving dramatically greater longevity within our lifetimes. The substance of the discussion begins at 4:25 in the recording. (i) How would you characterize the current state of efforts to reverse senescence / lengthen human lifespans? (ii) How does progress in the areas of research you have delved into compare to your expectations approximately 10 to 15 years ago? (iii) What are the most significant challenges and obstacles that you perceive to exist in the way of achieving serious reversal of biological aging? (iv) What key technologies and methods of delivering treatments to patients would need to be developed in order for longevity escape velocity to be affordably achieved society-wide? (v) What political reforms and societal / attitudinal changes would you advocate to accelerate the arrival of effective treatments to reverse biological aging and lengthen lifespans? (vi) Are you concerned about any current political trends and how they might affect the progress of research into combating biological aging? (vii) What can laypersons who are sympathetic to your goals do in order to hasten their realization? How can the effort to defeat aging become as popular and widely supported as efforts to defeat cancer and ALS are today? (viii) What lessons can the history of anti-aging research offer to those who seek to advocate and help achieve effective scientific breakthroughs in this area in the coming years and decades? “Genetic stabilization of transthyretin, cerebrovascular disease, and life expectancy” – Paper by Louise S. Hornstrup, Ruth Frikke-Schmidt, Børge G. Nordestgaard and Anne Tybjærg-Hansen. Arteriosclerosis, Thrombosis, and Vascular Biology. 2013;33:1441-1447, Originally published May 15, 2013. “Recognizing Degenerative Aging as a Treatable Medical Condition: Methodology and Policy” – Paper by Ilia Stambler. Aging and Disease. Dr. Bill Andrews is the President and CEO of Sierra Sciences – http://www.sierrasci.com/. As a scientist, athlete, and executive, he continually pushes the envelope and challenges convention. In his 35-year biotech career, he has focused the last 23 years on finding ways to extend the human lifespan and healthspan through telomere maintenance. As one of the principal discoverers of both the RNA and protein components of human telomerase, Dr. Andrews was awarded 2nd place as “National Inventor of the Year” in 1997. Dr. Aubrey de Grey is the biomedical gerontologist who researched the idea for and founded SENS Research Foundation – http://www.sens.org/. He received his BA in Computer Science and Ph.D. in Biology from the University of Cambridge in 1985 and 2000, respectively. Dr. de Grey is Editor-in-Chief of Rejuvenation Research, is a Fellow of both the Gerontological Society of America and the American Aging Association, and sits on the editorial and scientific advisory boards of numerous journals and organizations. Ira Pastor has 30 years of experience across multiple sectors of the pharmaceutical industry, including pharmaceutical commercialization, biotech drug development, managed care, distribution, OTC, and retail. He is the CEO of BioQuark, Inc. – http://www.bioquark.com/ – and Executive Chairman of ReAnima Advanced Biosciences – https://reanima.tech/. Dr. Ilia Stambler is a researcher at Bar Ilan University, Israel. His research focuses on the historical and social implications of aging and life-extension research. He is the author of A History of Life-extensionism in the Twentieth Century – www.longevityhistory.com. He is actively involved in advocacy for aging and longevity research – www.longevityforall.org.